The Channel Tunnel is a 50.5 km-long rail tunnel beneath the English Channel at the Straits of Dover. 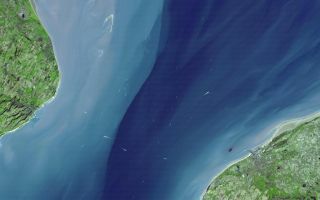 In this space wallpaper, the Channel Tunnel is a 50.5 km-long rail tunnel beneath the English Channel at the Straits of Dover. It connects Dover, Kent in England with Calais, northern France. The undersea section of the tunnel is unsurpassed in length in the world. A proposal for a Channel tunnel was first put forward by a French engineer in 1802. In 1881, a first attempt was made at boring a tunnel from the English side; the work was halted after 800 m. Again in 1922, English workers started boring a tunnel, and advanced 120 m before it too was halted for political reasons. The most recent attempt was begun in 1987, and the tunnel was officially opened in 1994.